Many of you might know today is my birthday. Since I really don't want to write a full-fledged blog post today, I thought instead I would do what I often do on holidays: post pin-ups. In this case I have 10 lovely Pisceans. They aren't in any particular order, although I saved my very favourite for last (if you know me well, you probably already know who it is). Author Lyndsy Spence has a talent for shedding light on remarkable women in British history. She has written biographies of such diverse subjects as the controversial Diana Mosley and beloved actress Margaret Lockwood. 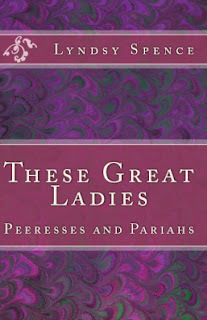 Her latest book, These Great Ladies: Peeresses and Pariahs, came out just last month. These Great Ladies: Peeresses and Pariahs is a collection of pen portraits of various women from British, 20th Century history. Some, such as Margaret, Duchess of Argyll and author Joan Wyndham, are still somewhat famous to this day. Others, such as Jean, Viscountess Massereene, have somewhat faded into obscurity. Regardless of how famous they are today, each and every one of the women profiled by Miss Spence is fascinating in her own right. What is more they are a diverse group, from those born on the wrong side of the tracks (as we would say in the Colonies) to aristocrats to one who was more royal than the British Royals themselves (Mariga Guinness). The stories Lyndsy Spence tells of these remarkable women range from the scandalous to the tragic. What is more, they are set across a wide swathe of Anglo-American society, from the country houses of the United Kingdom to the mansions of Hollywood. These Great Ladies: Peeresses and Pariahs presents us with women who married multiple times, women who fought drug addiction, women who lived bohemian lives, and women who went to great lengths to support various charities. Miss Spence writes of these women with a light tone, while at the same time recognising the seriousness of much of the subject matter (such as when dealing with the politics of the eras). What is more, she treats each of these women sympathetically, recognising that they were human beings who were both products of their times and their circumstances. Using a concise but very readable style, Lyndsy Spence is able to give us insight into her various subjects that isn't often seen even in full length biographies. These Great Ladies: Peeresses and Pariahs is highly recommended for anyone who is interested in British, 20th Century history, the British aristocracy, or who simply enjoys reading about the lives of fascinating women. In the book Miss Spence covers Margaret, Duchess of Argyll; Mariga Guinness; Sylvia Ashley; Joan Wyndham; Enid Lindeman:;Venetia Montagu; Irene Curzon; and Jean, Viscountess Massereene. 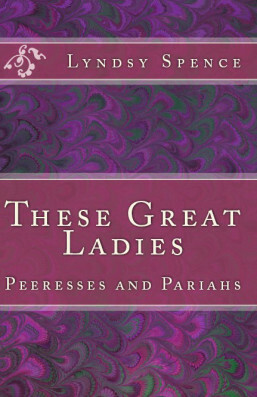 These Great Ladies: Peeresses and Pariahs is available through Amazon and various fine book sellers. Among American classic movie fans, Robert Osborne was a superstar. It would be difficult, if not impossible, to find a more beloved figure in the American classic movie community. He was the original host of Turner Classic Movies and for its first nine years its only host. For twenty three years Robert not only introduced movies on the channel, but also served as the host at the TCM Classic Film Festival and the TCM Classic Cruise. Quite simply, he was the face of Turner Classic Movies, more essential to the channel than its logo or any other branding. It is difficult to think of TCM without Robert, so it should come as no surprise that today is a day of sorrow for American classic movie fans. Sadly, Robert Osborne died today, March 6 2017, at the age of 84. Robert Osborne was born in Colfax, Washington on May 3 1932. His love of movies began in the small, farming community. He went to the cinema regularly, and eventually began working at both of the town's theatres, The Rose and The Roxy. He attended the University of Washington, where he majored in journalism. While at the University of Washington he spent a good deal of time in the library, going through twenty years' worth of The New York Times and taking notes on the movies that had been playing at theatres there. After graduating from the university he spent two years in the United States Air Force. After leaving the Air Force, Robert Osborne pursued a career in acting. He made his television debut in a small role in an episode of the Western anthology Death Valley Days in 1954. Robert appeared opposite Jane Darwell (perhaps best known for her role in The Grapes of Wrath) in a regional production of Night Must Fall in Seattle. It was Jane Darwell who convinced Robert to pursue his acting career in Los Angeles rather than New York City. Miss Darwell let him stay in her home in San Fernando Valley, and he received a six month contract with 20th Century Fox. He guest starred on the TV show The Californians. After meeting Lucille Ball, Robert Osborne signed with Desilu and studied acting under Miss Ball as part of the Desilu Workshop. Over the next several years he guest starred on the shows Westinghouse Desilu Playhouse, Whirlybirds, and Alcoa Presents: One Step Beyond. He had small, uncredited parts in the movies Psycho (1960), Spartacus (1960), and Twenty Plus Two (1961). He appeared on the ABC soap opera The Young Marrieds. Robert had a significant role in the pilot for The Beverly Hillbillies, "The Clampetts Strike Oil". There had been talk of his part being a recurring role on the show, but Robert turned it down with the thought that The Beverly Hillbillies would not be a success. He also appeared in commercials for such diverse products as Falstaff Beer, Carling Black Label Beer, Folgers Coffee, and John Hancock insurance. It was Lucille Ball who suggested that Robert Osborne leave acting to pursue a career in writing instead. His first book, Academy Awards Illustrated, was published in 1965. It was followed by Hollywood Legends: The Life and Films of Humphrey Bogart and Greta Garbo in 1967. In 1971 the first Academy Awards Oscar Annual by Robert Osborne was published. A new edition would be published each year until 1976. It was in September 1977 that he went to work for The Hollywood Reporter, writing reviews. In April 1983 he began writing The Hollywood Reporter's " Rambling Reporter" column. He continued to do so until June 2009. Even in the Seventies Robert Osborne was considered an expert on classic film, so quite naturally the Academy of Motion Picture Arts and Sciences asked him to write the official history of the Oscars. 50 Golden Years of Oscar: The Official History of the Academy Awards was published in 1978. It would be regularly updated over the years, with the latest edition being 85 Years of the Oscar: The Official History of the Academy Awards, published in 2013. It was in 1982 that Robert Osborne began working as an entertainment reporter for KTTV in Los Angeles. In 1984 he started a stint as a host on The Movie Channel. In 1987 he served as a contributor on CBS's breakfast television show The Morning Program. It was in in the Nineties that Robert Osborne received an offer from American Movie Classics (now simply AMC) to become their afternoon host once his contract with the Movie Channel expired. He turned them down to accept an offer from a brand new cable channel, Turner Classic Movies. His decision was based on the vast film library that Turner Broadcasting owned, including MGM's pre-May 1986 library. It was on April 14 1994 that Robert Osborne introduced the very first movie aired on TCM, Gone With the Wind (1939). 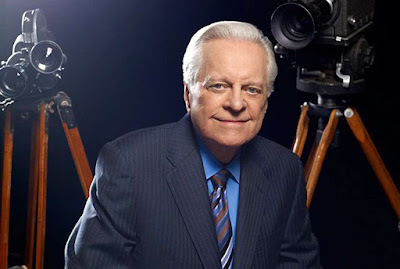 Robert Osborne became the face of Turner Classic Movies. He did much more than introduce movies on the channel, although that would have been enough to endear him to fans. He was the host of both The Essentials and Private Screenings. He hosted a number of special programmes on TCM. Robert also hosted the first many Turner Classic Movie Classic Film Festivals as well as the TCM Classic Cruises. He wrote articles for TCM's Now Playing guide. Beyond TCM, Robert Osborne also took part in the Paley Centre for Media's salutes to Lucille Ball and Cloris Leachman. In 2006 he began serving as celebrity greeter on the red carpet at the Academy Awards. He served as the host of Walt Disney World's The Great Movie Ride, also providing narration during the ride. There can be no doubt that Turner Classic Movies owes a good deal of its success to Robert Osborne. In fact, there is perhaps no other broadcast network or cable channel that has been so identified with a single personality. Robert Osborne had an encyclopaedic knowledge of movies that was perfectly suited to a cable channel dedicated to classic films. He also had an innate charm that was easily captured on camera. Robert could relay the most obscure film arcana without sounding boring or pedantic. Perhaps most importantly, his great enthusiasm for movies was readily visible on screen. Robert Osborne seemed much less like the great film historian that he was than a fan with an incredible wealth of knowledge about cinema. Indeed, today many Turner Classic Movies fans have expressed the feeling that they have lost a close friend or dear uncle, one who would tell them wonderful stories about the movies. To a degree that could be contributed to the illusion of familiarity that is created by seeing someone on television on a regular basis. That having been said, I do not think that explains why so many of us are grieving over Robert Osborne so much. Quite simply, we had a connection with Robert Osborne that we had with almost no other celebrities. Quite simply, we shared a love of classic movies. Indeed, at the Turner Classic Movies Classic Film Festival and elsewhere, Robert Osborne was always open and friendly with his fans. From more than one person I have heard that he was warm and congenial, and he spoke as if he had known one his entire life. Even if it was the first time one ever met Robert Osborne, he or she could be guaranteed a warm greeting. For Robert Osborne, every fellow classic film buff was a friend. In many ways Robert Osborne was the perfect ambassador for classic movies. It was not simply that he was enthusiastic about classic movies or even that he had an encyclopaedic knowledge of them. It was that he was quite simply a really nice guy. In his tribute to Robert Osborne in The Hollywood Reporter, Ben Mankiewicz tells how those who worked at TCM with Robert adored him. While one occasionally hears horror stories about big TV stars, one never heard any such stories about Robert Osborne. He was a true gentleman, a man without pretension who treated everyone with respect and kindness. It should be little wonder that he is being mourned so by movie stars, his co-workers, and his fans alike. Robert Osborne was one of a kind.